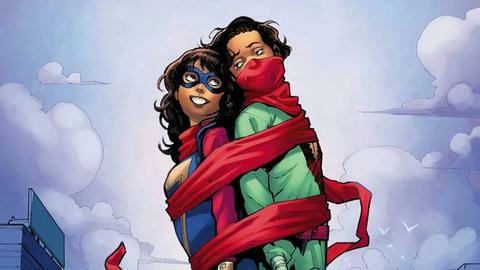 We look at the pros and cons of Kamala Khan's potential love interests. The Red Dagger returns in MS. MARVEL #24 by G. Willow Wilson and art by Diego Olortegui. In this thrilling adventure, Kamala will come face to face with a dangerous foe… teen hormones. To save New Jersey from a runaway train, Ms. Marvel had to team up with Red Dagger once again, but this time sparks are flying. Will Kamala be able to love again after so much heartache with Bruno? Is Red Dagger, in fact, her friend Kareem? What will he think of her superhero fanfic?! Also there’s a runaway train. That cannot be overemphasized. So. That, um, should probably be dealt with as well… but hey, a girl can multitask! To help clarify this new potential romance — and just what poor Kamala Khan’s battered heart has been with since she arrived on the scene — we’ve weighed the pros and cons of her potential paramours to see how Red Dagger (aka Kareem?!) holds up compared to the others. Is it true love or another dud? Only THE DATING GAME can tell! The Inhuman Kamran was cute, funny, and charming — Kamala got a huge crush on him in MS. MARVEL #14, even though they’d known each other for less than a day! And we can’t blame her… his personality is literally illuminating! And before you start, we know what “literally” means here at Marvel. He glows and stuff. It’s a neat party trick. What a catch! Pros: As an Inhuman and someone who shares her Muslim-American cultural experience, Kamran understood her in ways that few others could. Kamala had it bad for this boy, and they even almost kissed before the police told them to disperse. Cons: Kamran turned out to work for Lineage, the leader of the evil Inhuman army. To make matters worse, he tried to force Kamala to join him and his ilk — a boy who won’t take no for an answer? Not worth a second of your time, Kamala. Pros: He’s a kind-hearted web-slinging sweetheart and heartthrob to boot! They’ve had a few deep moments but nothing romantic. Cons: Miles has been known to pack up and jump universes. Our girl Kamala needs stability! Plus, he’s been linked to Gwen Stacy a.k.a. Spider-Woman romantically and Kamala is too good to end up as a rebound. Another member of her Champions team — do we sense a pattern here? — Nova revealed his secret identity of Samuel Alexander to Kamala and there was an awkward moment where he may or may not have been trying to have a “moment” with her. Pros: Powerful and brave, Sam has a pretty big chip on his shoulder… but when push comes to shove, he’s a guy you’d be proud to have on your team. Cons: Kamala just doesn’t seem all that interested, despite what the unquenchable and optimistic well of fan fic about the two might lead one to believe. Sorry, Sam. Maybe give it a little time. Kamala’s best friend Bruno Carrelli has been in love with her since they were little kids. They come from two separate worlds — Bruno is Italian-American and Catholic, Kamala is Pakistani-American and Muslim — which, according to her brother Aamir would be too hard for them to overcome. For most of their friendship, it wasn’t much of an issue, though. Bruno’s love went unrequited for years… until she realized she loved him, too, but her responsibilities as Ms. Marvel meant he should live his life without her. She couldn’t give him the time and attention he deserved, and besides — it was too dangerous for him if her enemies were to find out. Bruno got a girlfriend and Kamala is forced to think about what Bruno really means to her. Which turns out to be, quite a lot… romantic stylez. Pros: He’s brilliant (IQ of 170, according to Doctor Faustus), trustworthy (he was the only one Kamala told about her powers for a while), and he’s been completely devoted to Kamala since they were kids! He may be something of a goof, but he’s Kamala’s goof and they’re in love with each other. Shouldn’t that be enough? Cons: After the events of Civil War II, there isn’t that much of a relationship to salvage, friend or otherwise. Bruno begged Kamala not to get involved with Captain Marvel’s crusade to squelch out crimes before they happened, but the result was the construction of an internment camp. Bruno, ever the activist, tried to liberate some of the people who had been unjustly imprisoned but the attempt went awry and Bruno was left severely injured. In fact, he gained some permanent physical handicaps as a result… and he blames Kamala. Now he’s going to school off in Wakanda, but hey, Skype exists in Earth-616, right? 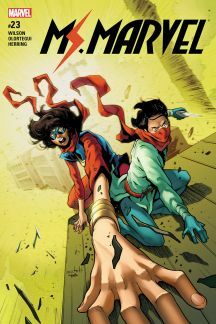 Kamala Khan hasn’t seen the mysterious Pakistani vigilante Red Dagger since their meeting 12 whole issues ago when he helped her save the day in Karachi and helped clarify her crisis of conscience during the tumultuous events of Civil War II. Though we technically never found out the civilian identity of Laal Khanjeer (translated: the Red Dagger), Kamala has had her suspicions that he might be her new friend-in-law, Kareem! Pros: Kamala doesn’t know too much about Red Dagger, but he did help her out when she needed him and he’s a morally upstanding young dude who she can respect. If he is Kareem, then she’s also compatible with him as a friend. A strapping heroic vigilante who can help her fight crime + a friend she can goof around with in her off-time + someone who understands her culture and the values she holds dearest to her heart? We may have a winner! See Ms. Marvel and her potential new crush in action on November 8th in MS. MARVEL #24 by G. Willow Wilson and Diego Olortegui, wherever comics are sold!